Little Labs have acquired a reputation for making high-quality problem-solving boxes. Their IBP phase-alignment tool, reviewed in SOS November 2003, and since modelled by Universal Audio for their UAD plug-in platform, is probably the best known of their designs, but their Redeye DI and re-amp box, and STD instrument cable extender received favourable reviews in SOS, and Little Labs make several other useful preamps, processors and gadgets. 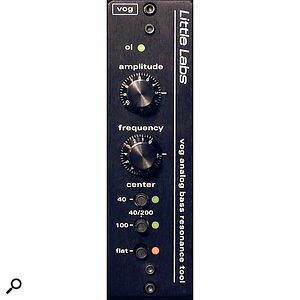 Unlike most of Little Labs' designs, their Voice Of God, or simply 'VOG', comes in API 500-series 'Lunchbox' format, although when it was launched Little Labs suggested that it might become available in stand-alone form at some time in the future. In the fleeting but more than adequate 'preliminary operators manual' (a more detailed and technical one is promised), designer Jonathan Little says that the VOG was originally conceived as a means of deepening or reinforcing voice-over and vocalist recordings without having to rely on a directional mic's proximity effect — hence the reference to the big guy upstairs — but that it wasn't until he used the processor on kick and bass that he realised how useful it could be in a music recording and production context. Essentially, the VOG is a high-pass filter with a very narrow-Q boost centred around the turnover frequency. You have control over the amplitude of the boost (up to a maximum of 18dB), and can set the frequency to anything between 20 and 300Hz, taking you from sub-harmonic territory up to the fundamental of a kick drum and on into its upper harmonics, for example. 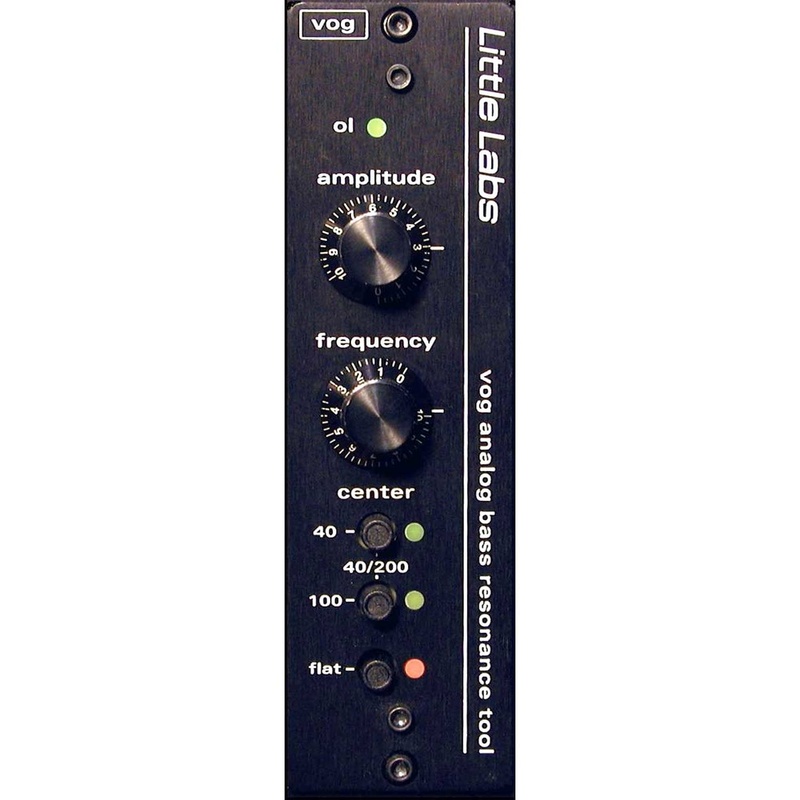 The idea is that you dial in an LF boost to reinforce the low end of a sound, while the steep (24dB/octave) high-pass filter removes the unwanted 'flab' beneath that frequency. So, for example, you could use it to separate out the kick drum and bass guitar, by giving them their own complementary resonances without worrying about the low frequencies eating up all your headroom and muddying up the mix. There are only two dials: one to control the peak amplitude and the other to sweep the frequency. There are also two 'Center' buttons, used to set the centre frequency when the Frequency dial is in its middle position ('5'), and a 'Flat' button, which flattens (but does not bypass) the filters. The lack of bypass isn't a huge issue, as the signal is very clean. It's certainly clean enough that you can compare the original and processed sounds. Using different combinations of the Center buttons you can set the centre frequency to 40, 100 or 200Hz. The VOG is incredibly easy to use. I tested it on sources including kick drum, bass guitar and some drum loops, as well as on my own voice. It certainly lived up to its name, easily bringing out the deep, chesty resonances in my voice. I'd be perfectly happy using proximity bass boost coupled with a high-pass filter to do a similar job, but the VOG makes that particular effect very easy to achieve without you having to worry about the mic. On kick and bass‚ and on kick in particular, the results were beautiful. A rich, smooth warmth was stunningly simple to bring to a kick drum, as was shifting the emphasis of the kick sound to fit it snugly around a bass part. I was able to venture further, too, taking an acoustic kick almost into pitched electronic drum territory. I thought I'd see how precisely I could set the frequency, and fed a complex drum loop through the VOG. To my surprise and pleasure, I was able to manipulate the kick without affecting any of the low end of the toms. I tried using the VOG for more creative effects too. For example, I found I could use the Center and Flat switches to change the pitch of the kick drum within the loop and could use the Frequency control to sweep the resonant pitch up or down over the course of the loop. Could be a nice trick for the remixers out there! On bass, the results were also good, although it was sometimes more difficult to achieve the desired result. It's easy to inadvertently boost individual notes on a melodic line, for instance, but as long as you use your ears, you have sufficient control to avoid that, while still achieving the reinforcement you're looking for. Thanks to KMR Audio for the use of an API Lunchbox rack during the testing the VOG.